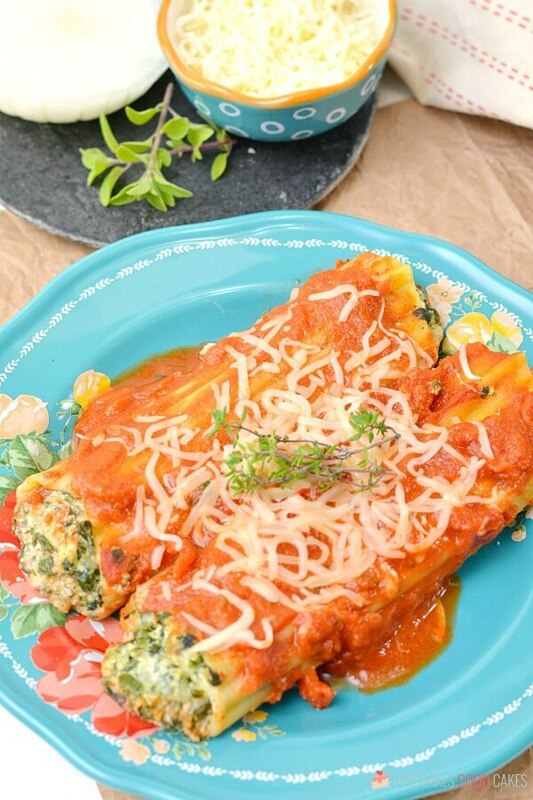 This Spinach Ricotta Manicotti is an Italian-American classic that features pasta shells filled with a delicious mixture of spinach and ricotta cheese then topped with red marinara sauce. Hey, friends! Today I’ve got a recipe that is perfect for meal preppers who like to plan ahead with freezer meals or people looking for a dinner idea that’s a little more special than normal. 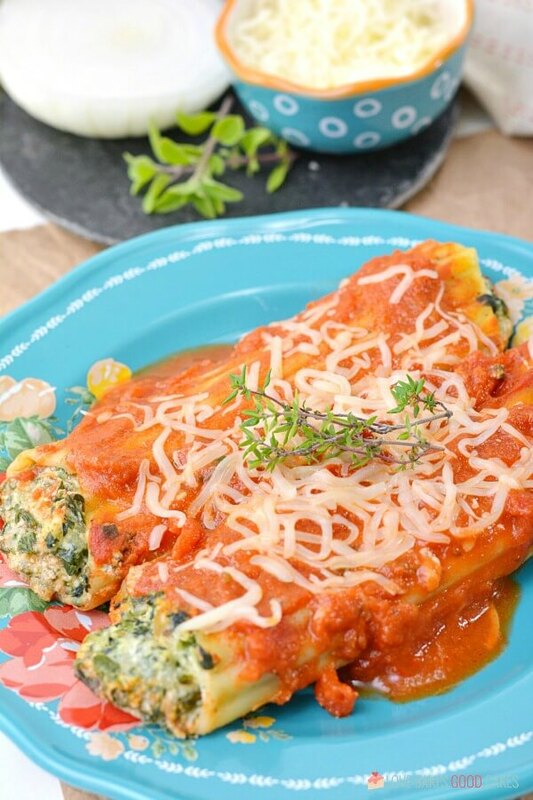 Although making manicotti does take a little bit of work, it’s not crazy hard and really, it doesn’t take too long – and the reward is sooooo worth the extra time and work. 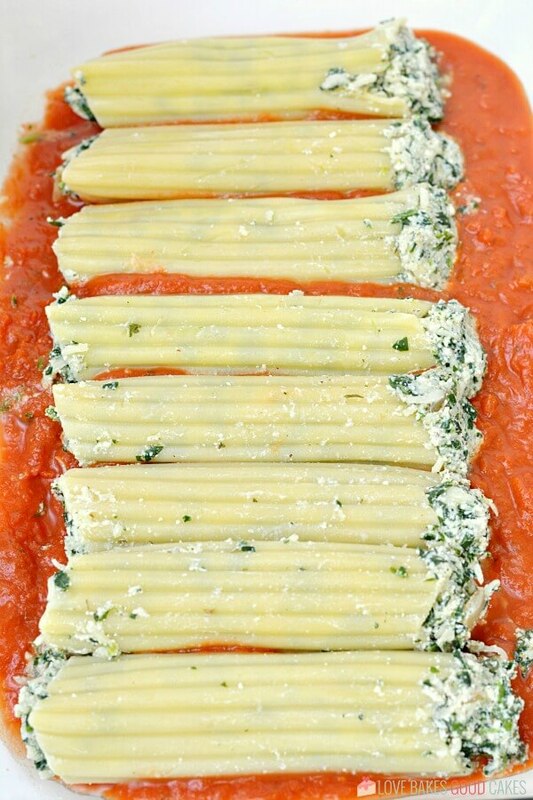 This Spinach Ricotta Manicotti is perfect for special occasions. We had it for Christmas Eve a few weeks ago and I plan on making it for my family again on Valentine’s Day. It’s perfect for a weeknight meal and special enough to serve to company or for a holiday meal. 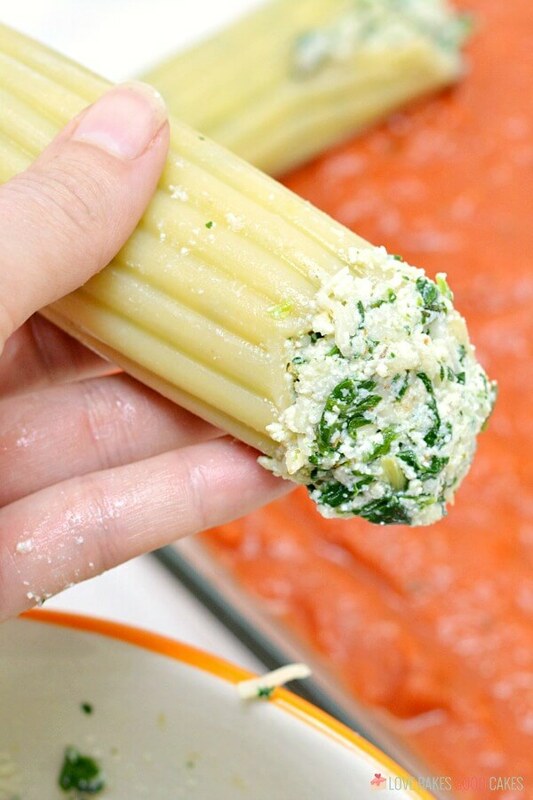 Can Spinach Ricotta Manicotti be frozen? Yes! 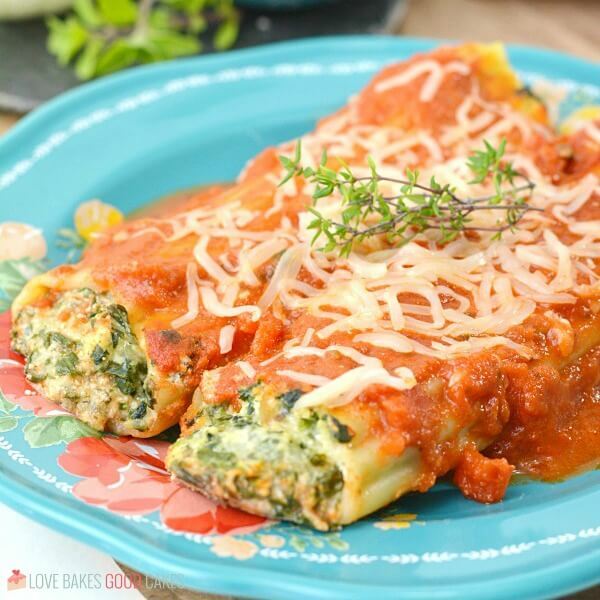 Spinach Ricotta Manicotti is a great make-ahead meal! Prepare the manicotti as directed in the recipe. Cover and freeze the unbaked casserole. To use, partially thaw the manicotti in the refrigerator overnight. Remove from refrigerator 30 minutes before baking. Preheat oven to 350°F. Bake casserole as directed in the recipe, increasing time as necessary to heat through and for a thermometer inserted in center to read 165°. 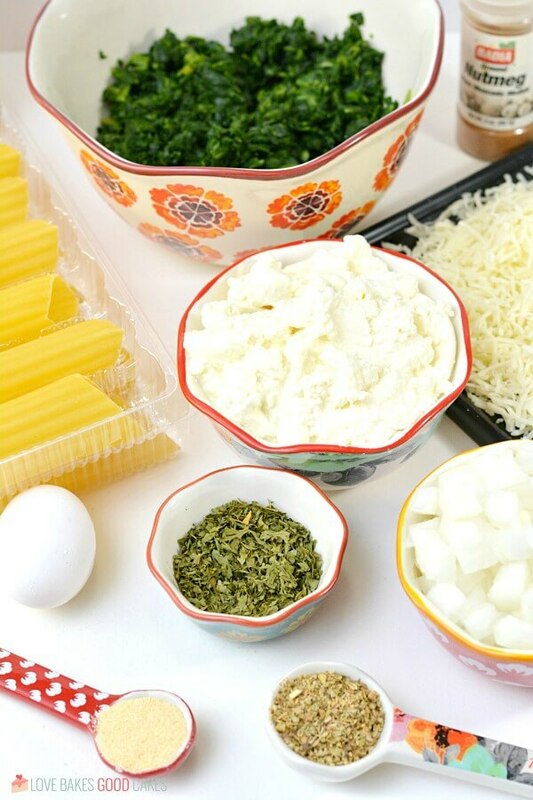 Can I use a cream sauce to make Spinach Ricotta Manicotti? If you prefer a creamy sauce, feel free to substitute the same amount of Alfredo sauce in place of the marinara sauce. Proceed with the recipe as directed. 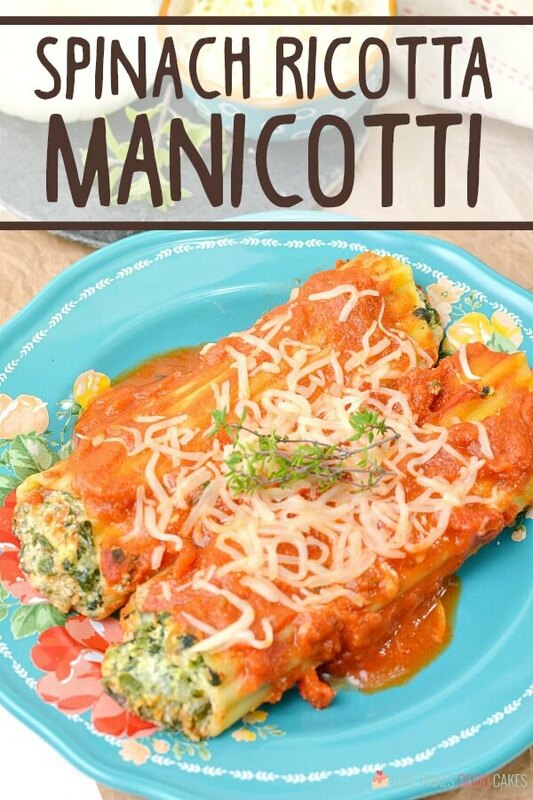 How do you stuff manicotti without breaking the shells? Usually, I like to slightly undercook my shells knowing they will finish off cooking in the oven. I boil my shells for 5 minutes, regardless of what the package says. Immediately rinse them in cold water to stop the cooking process and so the pasta doesn’t become mushy. I scoop them out of the water one by one and rinse them off immediately. This helps keep them from sticking together and from breaking. 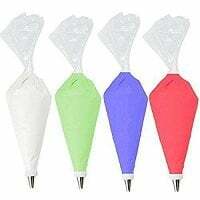 In my experience, it is easiest and fastest to use a pastry bag without a tip (large zip-top bags work great, too!) filled with the ricotta mixture. 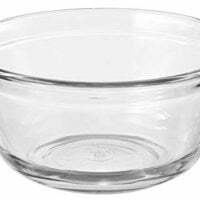 You’ll want to cut the piping hole close to the same size as the manicotti shell circumference to make filling quick and easy. To prevent filling from oozing out the other end of the manicotti, insert the tip halfway into the tube and fill it from the center out, then repeat with the opposite end. 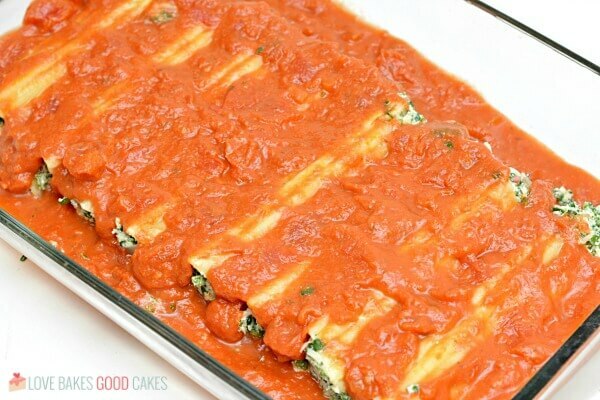 Can I add chicken, shrimp, ground beef, or sausage to Spinach Ricotta Manicotti? Yes! You can add cooked and chopped chicken or shrimp. Or ground beef or Italian sausage that has been crumbled, browned and drained. Add your choice of protein into the ricotta mixture and fill the shells as noted in the recipe. 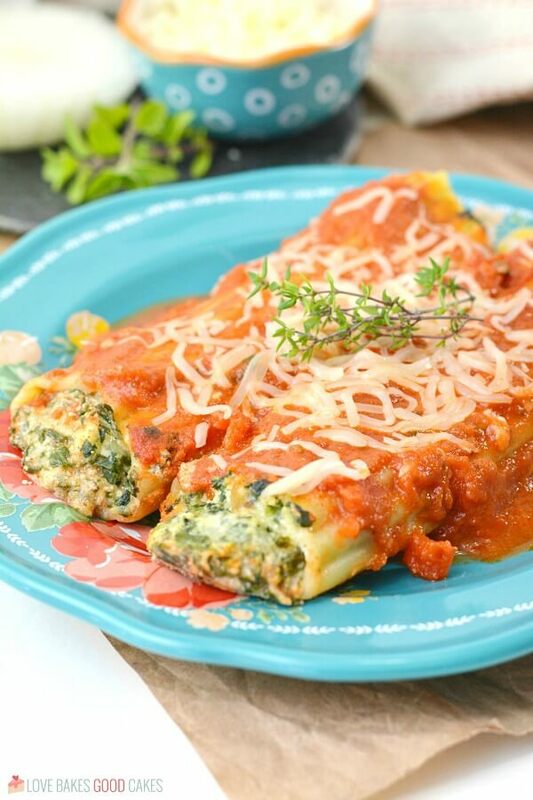 What do you serve with manicotti? I usually like to serve manicotti with a simple side salad – like my Italian-Style Salad. In my opinion, Garlic Bread is a must! If you’re looking for something sweet to finish out the meal, I would opt for a lighter dessert like White Chocolate Lemon Truffles or Strawberry Shortcake Parfaits. Start boiling water for the manicotti shells. When the water comes to a full boil, add the manicotti, and cook for 5 minutes. Drain the noodles and rinse with cold water immediately to cool them down, and to keep them from sticking. Meanwhile, place olive oil and chopped onions in a skillet sauteeing over medium heat until the onions are browned and translucent. Remove from the heat to cool. 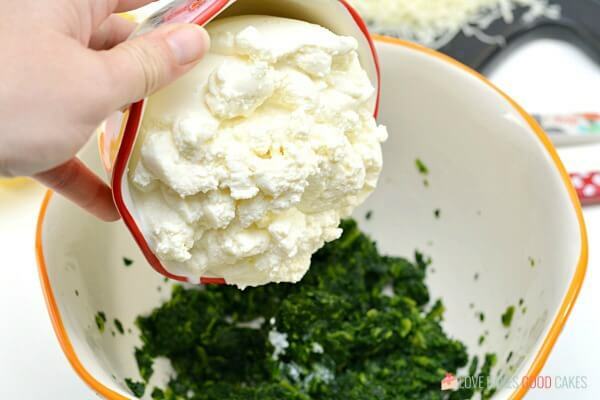 Add ricotta cheese and spinach to a large mixing bowl. 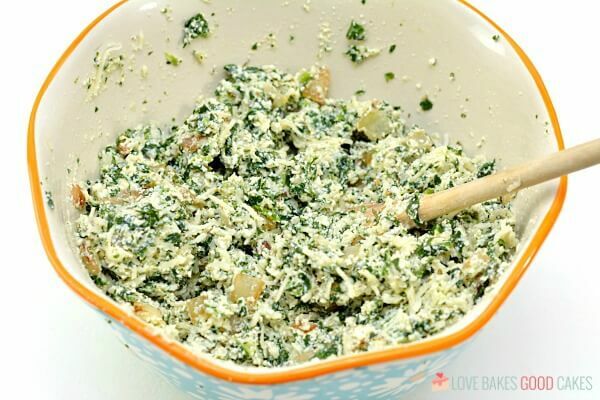 Add the egg, parsley, oregano, garlic powder, and a pinch of nutmeg. Mix thoroughly. Add in the cooled onions and Mozzarella cheese. Pour a jar of spaghetti sauce into the bottom of a 9x13 inch baking dish. Using a piping bag filled with the ricotta mixture, fill the manicotti shells. Overfill just a bit, but not enough to break the manicotti noodles open. Place the filled manicotti noodles into the bottom of the 9x13 baking dish, on top of the spaghetti sauce. Pour another jar of spaghetti sauce over the top of the filled noodles in the baking dish. Bake the manicotti for 30-40 minutes, or until the filling is just starting to turn brown, and the sauce is bubbling. Top with additional shredded mozzarella cheese and garnish with fresh herbs. 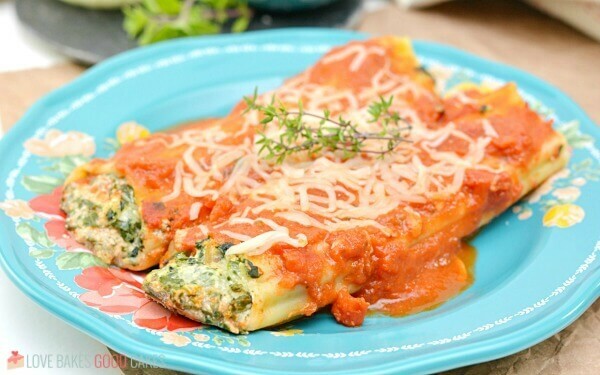 This Spinach Ricotta Manicotta is a great make-ahead dish! How to freeze: Prepare the manicotti as directed in the recipe. 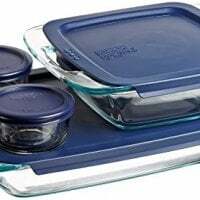 Cover and freeze the unbaked casserole. To use, partially thaw the manicotti in the refrigerator overnight. Remove from refrigerator 30 minutes before baking. Preheat oven to 350°F. Bake casserole as directed in the recipe, increasing time as necessary to heat through and for a thermometer inserted in center to read 165°. This recipe is so perfect for me as I don’t eat meat. Thanks for inspiring my family dinner tonight! These look incredible! I actually really love spinach. I think this is something my whole family will love. who doesnt love cheesy noodles?! just looking at these makes my mouth water!! on my list for must make sure this week!! This has become one of our favorite dinner recipes. We loved it!